To all those TechCrunch commenters who took offense at our previous coverage of the singer Prince’s intentions to sue YouTube, The Pirate Bay and eBay for copyright infringement in September, read this carefully. Prince has now decided the best way to endear himself to his most loyal fans is to threaten to sue them directly. According to the BBC Prince is using Web Sheriff to demand that fans remove all and any album covers, images of him in concert and any Prince lyrics from their fan sites. 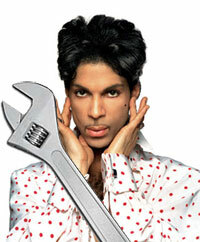 Sites that fail to act on the demands should expect legal action to follow as Prince is claiming breach of copyright. For some fans this sort of one-on-one attention from their idol will be a dream come true, but for the majority of Prince’s ever decreasing fan base, being sued for the crime of printing lyrics on a web page, running an image of Prince, or worst still, running an Amazon affiliate ad that includes a Prince album cover won’t be welcomed.